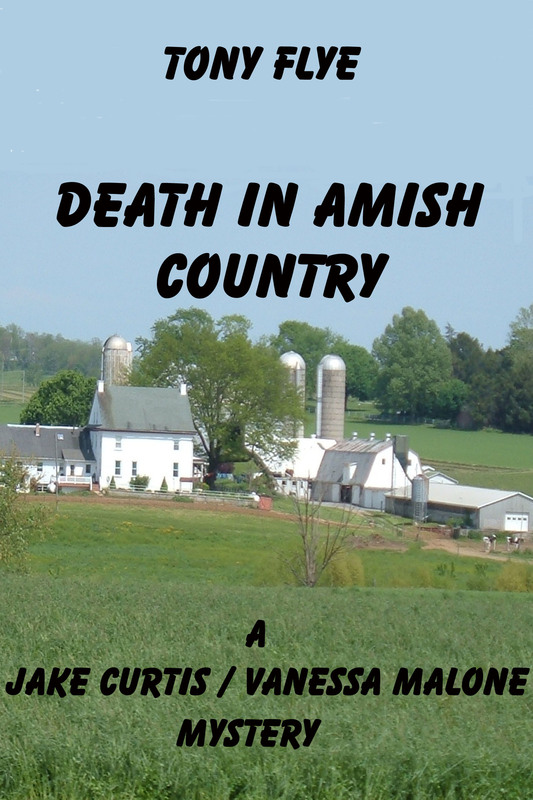 Sales of my new book “Death in Amish Country, A Jake Curtis / Vanessa Malone Mystery” are taking off. Reviews of the book are great. You can obtain your copy at https://www.smashwords.com/books/view/474792. You can also obtain your copy from Barnes & Noble for your Nook at http://www.barnesandnoble.com/w/death-in-amish-country-a-jake-curtis-vanessa-malone-mystery-tony-flye/1120336904?ean=2940046159585&itm=1&usri=2940046159585. Either way I’m sure you will enjoy this exciting mystery set in the Pennsylvania Dutch country of Lancaster Pennsylvania. The up and coming private investigation team of Jake Curtis and his wife Vanessa Malone, who is also an attorney are called on to prove Jake’s Marine buddy, Gordon Meade, innocent of murdering Amos Stoltzfus, who just happens to be his fiance’s father. According to the newly deceased, Amos Stoltzfus, anyone not born of Amish parents should not be allowed to join the Church. After Gordon Meade converts to the Amish faith, he asked Amos’ daughter, Rebecca, to marry him. She said yes. This is the cause of Amos Stoltzfus’ harangue about purity in the Amish church. Fighting is against the Amish precepts but when Amos spies Gordon kissing Rebecca, Amos charges at Gordon, fists raised. When in the heat of their scuffle Amos slaps Rebecca, Gordon instinctively reverts to his Marine Corps training and attacks Amos. The fight carries itself into the barn where a lantern is knocked over and a fire instantly turns the barn in a black smoke filled inferno. Gordon carries Amos Stoltzfus from the burning barn, not knowing Amos is dead. Gordon is arrested at the scene on the word of Rebecca’s brother, Caleb. Gordon maintains his innocence and it’s Jake’s and Vanessa’s job to find the real killer. Caleb recants his story under intense questioning by Jake and Vanessa. The charges against Gordon are dropped. The prevailing sentiment among the Amish community is that Gordon will never be truly innocent until the real killer is found, tried and convicted. This is now Jake and Vanessa’s main objective. Among other members of the Amish community, Jake and Vanessa meet an older, all wise Amishman who treated Gordon as the son he never had after Gordon retired from the CIA and wanted to live the peaceful Amish life. Jake and Vanessa’s search takes them through dialogues with the Amish folks in their normal surroundings, their farms, their woodworking shop, Amish worship service and an Amish barn raising. Everywhere their journey takes them, Jake and Vanessa are frustrated by the Amish who claim not to have any idea of who would want Amos Stoltzfus dead although most everyone they talked to would’ve gladly shunned him; a punishment far worse than death for an Amish person. Their search takes Jake and Vanessa too close to a potential murderer who, along with his two buddies, attacked and put Vanessa in the hospital. Jake called for reinforcements, namely Marine Corps platoon corporal Ben Lyons and his wife Marilyn St. Clair to protect Vanessa. In order to give Jake some distance from the apprehension and any such actions that might have been employed in capturing Vanessa’s attackers, Ben Lyons calls for reinforcements of his own. He calls four former buddies from his and Jake’s platoon, one of which, a navy Corpsmen, whose particular talents lie in patching tortured informants for further torture. Lyons and his platoon find the three supposed Amishmen who attacked Vanessa in a seedy and rundown section of Lancaster city. The leader of the group offered to name his own cousin as the killer for a pass on beating Vanessa. After a lengthy and frank discussion with Lyon’s platoon,the three men are arrested. While in jail, the leader is severely beaten by a group of bikers in the over crowded cell. He later dies of his own beating. Jake and Vanessa were back at square one as the cousin was never seriously considered as the killer. Jake is in a low spot in the investigation. He’s ready to chalk up the whole investigation as a failure and go home. Jake and Vanessa along with Gordon are invited to a farewell thank you supper at the Stoltzfus’ farm on their last night in Lancaster County. The mystery is solved in one of the many startling twists in this investigation. You will thoroughly enjoy this mystery set amidst the bucolic beauty of Pennsylvania Dutch Amish Country.